This Dual Fuel Ventless Fireplace with Mantel offers a classical look that makes a great addition to any home. This compact fireplace features our quality wood mantel with a classically arched gas fireplace insert that accents the overall design of the furniture. Features a thermostat control and battery assisted Piezo ignition to fit and maintain your desired settings. No outside ducts or venting needed! Extra decorative features of light distressed marks throughout for a rustic feel to create a stunning home experience. 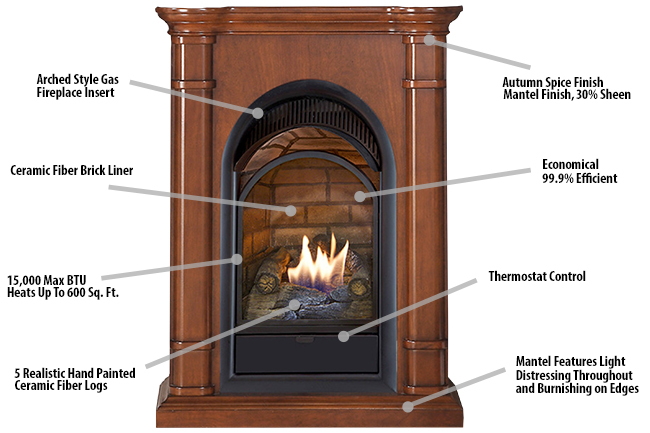 Mantel can be installed flat against the wall or placed in the corner of a room. A corner adapter kit is included.